North Korean leader Kim Jong-un’s latest meeting with Chinese President Xi Jinping is fueling speculations about Pyongyang’s intentions and the future of denuclearization talks. On Tuesday, Kim arrived in Beijing accompanied by a large entourage, and met with Xi for the third time in as many months. According to North Korean media, Kim declared that North Korea will cooperate closely with Chinese leadership in “the historic journey to open a new future on the Korean Peninsula and the region,” at an event hosted by Xi on Tuesday. “(North Korea and China) helping each other and cooperating transcends the traditional relationship between the two countries, two parties, and shows that it is developing into a special relationship with no precedent,” Kim was quoted as saying by the North’s Korean Central News Agency. While information on the Kim-Xi meeting remains scarce, Seoul welcomed the developments. “The North Korea-China summit is another step forward in denuclearization,” Cheong Wa Dae spokesman Kim Eui-kyeom said. Describing China’s role in denuclearization as a “safety net” from Pyongyang’s point of view, Kim Eui-kyeom added that China will play an important role in establishing peace on the peninsula. Some experts, however, say that recent developments are unlikely to be positive for the denuclearization process, as the meeting took place before North Korea took any steps in relation to the US-North Korea agreement declared at the June 12 summit. 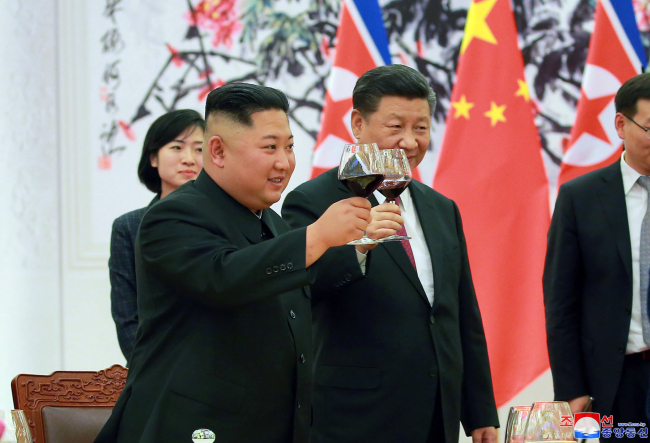 “The point of interest now is the steps (North Korea) will take for denuclearization, but instead (Kim Jong-un) went to China, where Xi talked about strengthening China-North Korea relations,” said Cha Du-hyeogn, a visiting research fellow at the Asan Institute for Policy Studies. Cha also said that the circumstances of the meeting suggests that the North wants to pace itself in dealings with the US. Cha added that for China, closer relations with Pyongyang shows that it cannot be overlooked in negotiations on declaring an end to the Korean War and other related issues. He added that after the US-North Korea summit, the Trump administration has taken steps in accordance with the agreement reached between the two sides, but Kim has yet to take corresponding action, referring to the decision to suspend joint South Korea-US military drills. The US government, and President Donald Trump have yet to comment on the latest Kim-Xi summit, saying only that the related developments are being closely followed. Trump has in the past expressed skeptical views of Kim’s dealings with China. Speaking to reporters before his third summit with President Moon Jae-in on May 22, Trump hinted that he suspects Kim’s actions are being influenced by Xi. Soon after the May 8 meeting between Kim and Xi, North Korea resumed its criticism of Seoul and Washington, which prompted Trump to call off the US-North Korea summit on May 24. “We’re watching it carefully; we’re watching it closely. We have -- we are continuing communications with the North Korean government,” US State Department spokesperson Heather Nauert said in a press briefing Tuesday. In what may be a change of tone from Trump’s earlier remarks on the Kim-Xi relationship, Nauert emphasized that China was committed to denuclearization.